CLICK Photo for full-screen view. If two barrels are better than one, then why not three? That’s the thinking behind the exotic new BD14 from Blaser, unveiled at the 2014 IWA Show in Germany. This “bockdrilling” three-barrel firearm works as a shotgun, large-caliber rifle, and small-caliber rifle all in one. Even with all those barrels, the BD14 is relatively light, at 3.3 kg (7.26 lbs) without optics. That makes this a nice, carry-around gun for stalking. As you’d expect from Blaser, the twin triggers are crisp and precise, with a pull weight of just 1.43 lbs (650 grams). The front trigger is for the large-caliber rifle barrel, while the rear trigger works both the shotgun and small-caliber barrels, via a tang-mounted selector. Sorry, we don’t yet have a USA-market price on this example of gun-making exotica, but you can bet it will be expensive. “The ‘Bockdrilling’ is, put simply, an over/under (O/U) rifle-shotgun combination with a smaller caliber rifle-barrel… on the side. The barrel arrangement [allows] for an extremely slender receiver, making the BD 14 exceptionally huntable. The brand new Vertical Block Lockup…has been filed for patent. 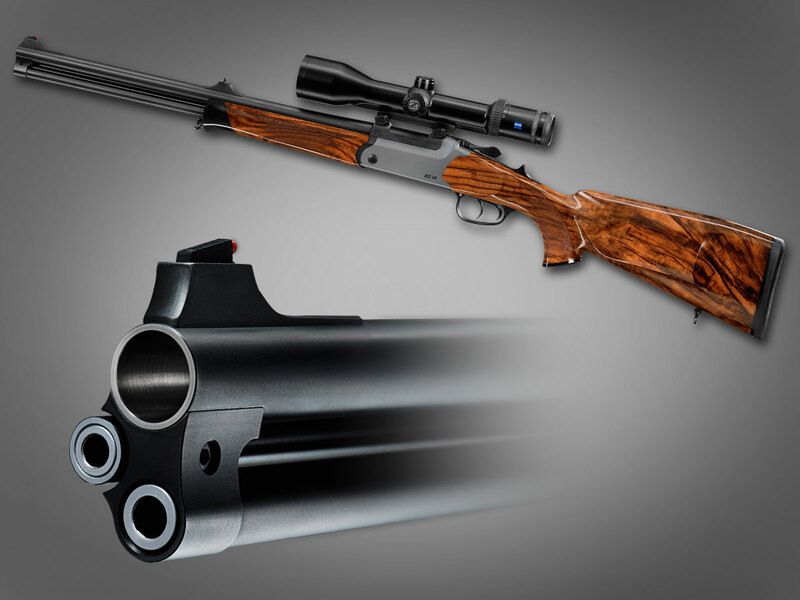 It combines an extremely compact and solid block lockup in a closed system within the monoblock with the comfortable handling of a classic break-action rifle. Share the post "Three-Barrel BD14 ‘Bockdrilling’ from Blaser"